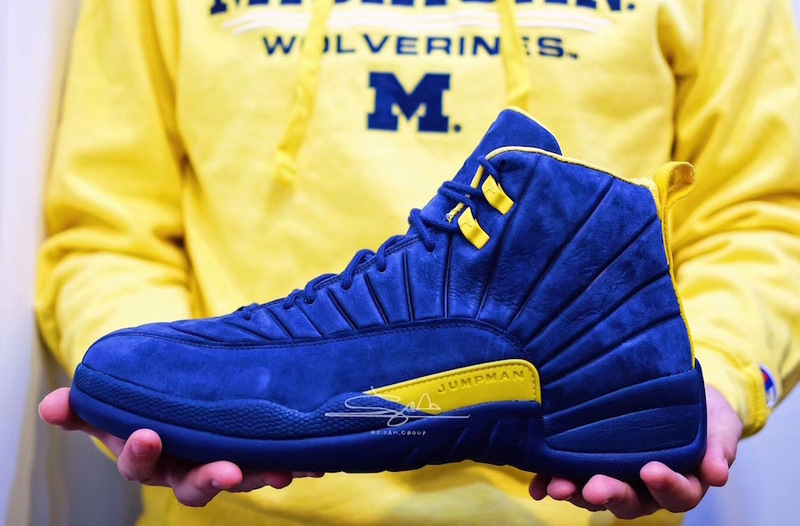 While the latest PSNY x Air Jordan 12 released during Summer 2017, Jordan Brand has designed a special edition Michigan PSNY Air Jordan 12 PE for the school’s football squad. Shared by Sonny Anderson, head football equipment manager for the Wolverines. This Air Jordan 12 features a full Navy Blue upper paired with Yellow Maize accents on the inner liner, insoles, upper eyelets, midsole and back pull tab. Completing the player exclusive is Michigan’s “M” block logo on the right tongue. Don’t expect these to release anytime soon, but you can get a closer look at the PSNY x Air Jordan 12 “Michigan” PE below. Let us know what you guys think of them in the comments section. UPDATE: Detailed photos of the PSNY x Air Jordan 12 “Michigan” PE via s.sam.group.